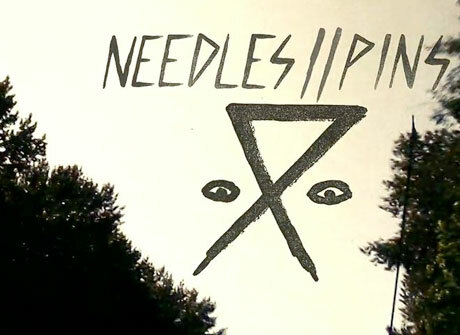 Vancouver pop-punk trio Needles//Pins released their debut LP 12:34 last summer, and around the same time, the band filmed a video for the album's "Shaker." The roof-bound clip has now been unveiled, and you can watch it down below. The Anthem Jackson-produced video finds the crew cranking out the cut on the roof of Vancouver's China Cloud, though we're pretty sure those squiggly animated lines and hand-drawn caped critters that cascade across the screen were added in post-production. Other wacky bits include the troupe pulling an instrument switcheroo, a Cariboo beer break, and the arrival of a long-haired fan freaking out over the tune's sheer awesomeness.